Easter is coming and with it comes visions of warmer weather, spring colors and loads of decorations. 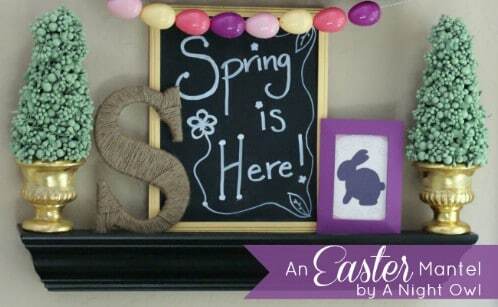 If you are someone who enjoys making your own Easter décor, we have a great collection of DIY decorations for you. 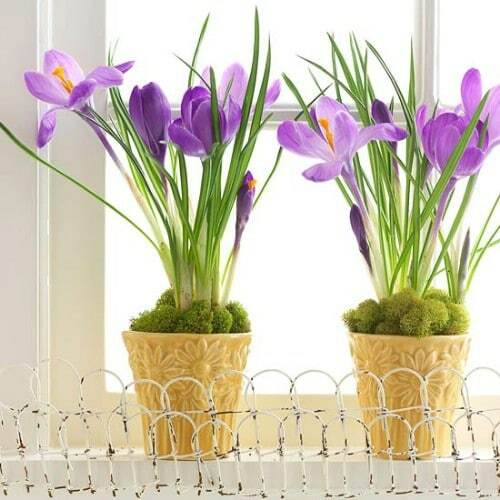 If you are anxious for those beautiful outside flowers to begin blooming, you can create your own little window garden with potted plants and decorate your home for Easter at the same time. This works great if you have a window box or if not, you can create the illusion of one. You can use whatever plants you want and even create a fence for them so that it looks like you have a spring garden even if the weather is not quite cooperating. These topiaries don’t actually contain marshmallow Peeps. They have Peeps that you can create yourself in a larger size out of Styrofoam. These little topiaries would look great next to your front door and if you have room, create one for each side of the door. You can decorate with greenery, ribbons, large plastic Easter eggs or practically anything you want. This is a really easy project that is certain to get attention from all of your neighbors. 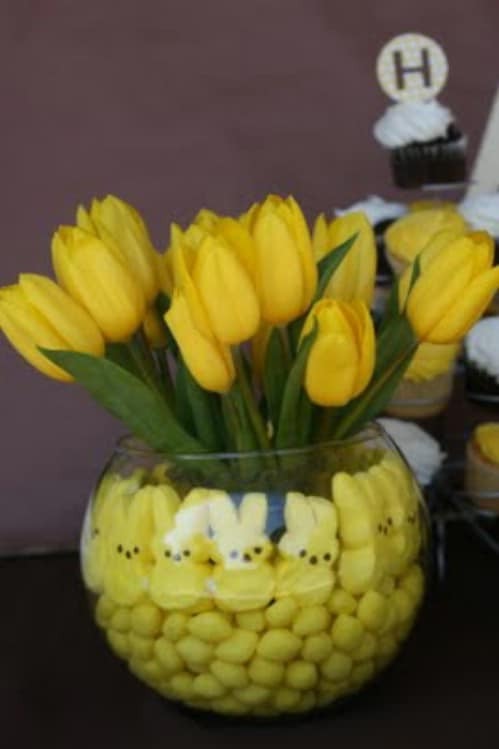 Lemon drops and yellow marshmallow Peeps will give you the basis for a beautiful display for your favorite tulips. Incidentally, if you want to mix and match colors, that’s ok. If you prefer purple Peeps with your yellow lemon drops and a mixture of yellow and purple tulips, that would work too. Just use your imagination and your colors of choice to create a beautiful vase for those tulips. Melon baskets aren’t just for summer. 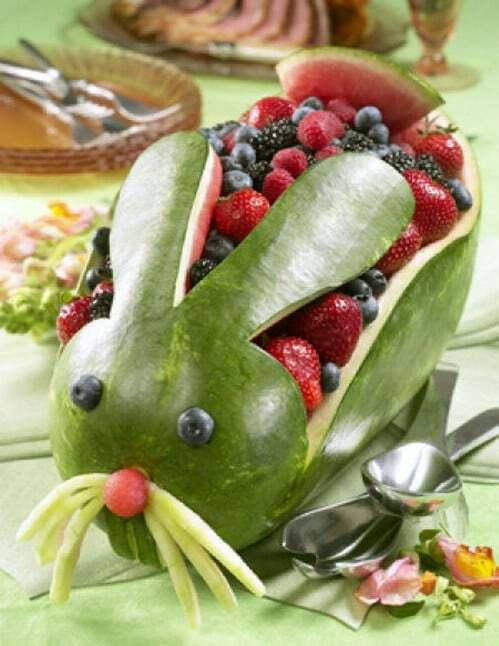 Consider creating a whimsical bunny from your watermelon and then fill it with colorful fruits and melons. You can also add a few jelly beans, Peeps or any other type of Easter candy if you want. This little project will take you very little time and will look great on any Easter celebration table. You can use fruits and berries to make the bunny’s face and the only actual work involved is in the carving. You can buy Easter garland if you want but the real fun and satisfaction comes from making it yourself. Garland can easily be made into bunny shapes with just a bit of cutting and then you can use cotton balls for the tail or add wiggly eyes to make it whimsical. You just need the basic shape of the bunny and you can cut it out of construction paper, wall paper or anything you want to make your garland from. 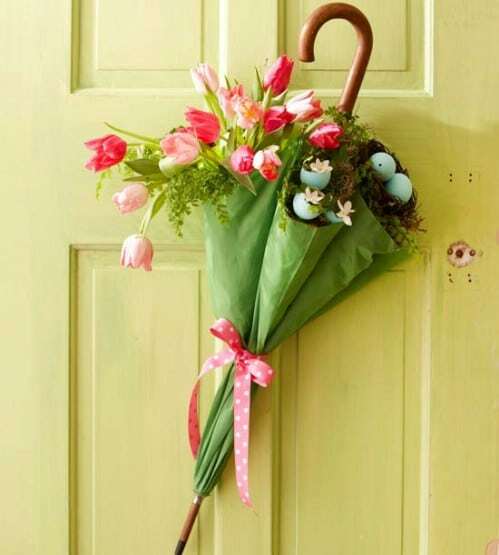 If you want to liven up your door for Easter or for spring in general, think about putting flowers – real or silk- on the door. You can use an umbrella, small basket or even a floppy hat to hold your flowers. Just arrange them in whatever way you want and tie them all together with a spring colored ribbon. To really give it an Easter look, add a few plastic eggs in various colors. 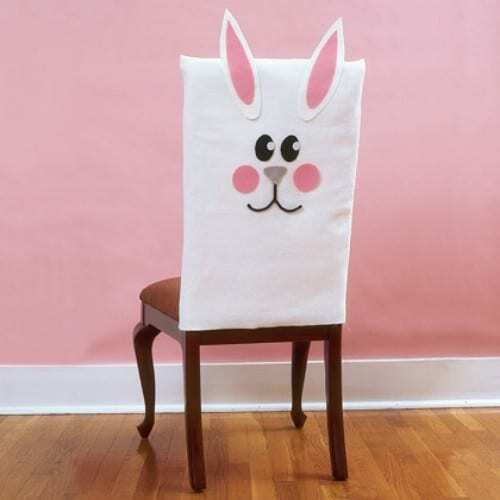 Dress up your dining room or kitchen by making your very own Easter Bunny chair covers. You can create chair covers for virtually any holiday or special occasion with little or no sewing. For the bunny covers, you just need some white felt and fabric glue. Just create your little bunnies, complete with pink ears and then add whimsical facial features. Kids will love sitting down to dinner when they get to do so on an Easter Bunny chair cover. 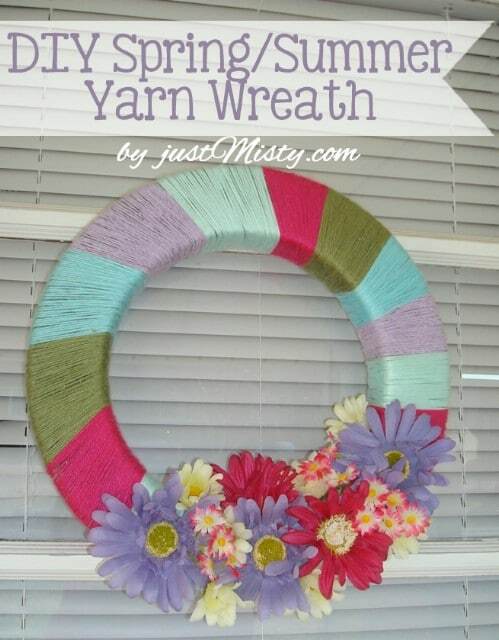 You can create a beautiful wreath with a base and some colorful yarn. You don’t have to know how to knit or crochet for this project. You simply have to be able to wrap and cut. This is a really easy wreath and will look wonderful on your door. You can decorate with plastic eggs, flowers, an Easter Bunny or just anything you want to express yourself. You can use the wreath throughout spring to give your home a very welcoming look. Like the traditional Christmas Tree, an Easter Tree is sure to fill your home with holiday cheer. You can buy trees at most department and craft stores but the fun is in making your own. You don’t need to make a complicated tree with numerous branches, either. 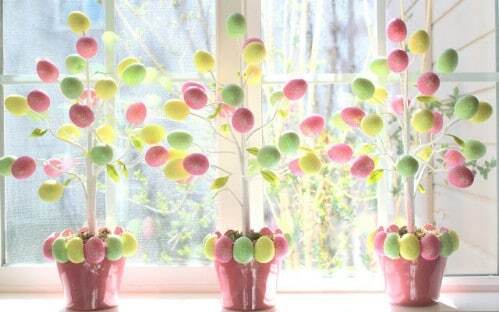 You can simply create a tree made from Easter Eggs with a few craft supplies. Kids will love helping with this project and you can display your lovely tree as a centerpiece on your Easter Dinner table. 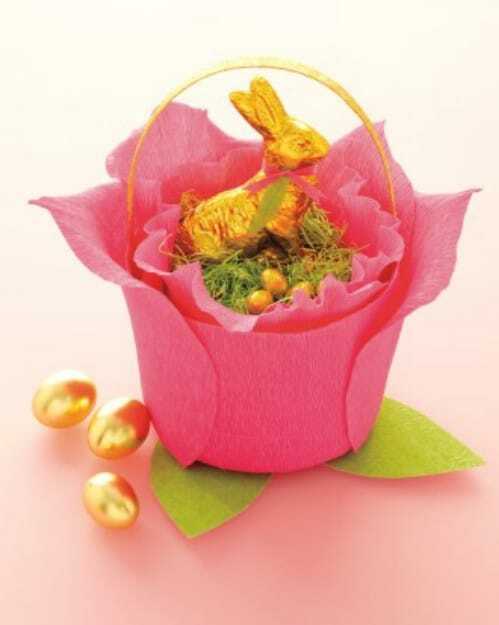 Imagine your home filled with adorable baskets that contain yummy chocolates and other Easter candy or colorful eggs. Instead of buying loads of baskets, why not just create them yourself? You can make baskets from crepe paper in a number of different colors and make them any size you need. These little baskets are great for hall tables or you can make a larger one for your dining table centerpiece. The colors that you use and the decorations are all up to you. You can make an adorable photo display for your entryway with a few paper straws, a picture frame and a few other key supplies. This is a wonderful project for kids (as long as you do the cutting for them) and adults of all ages. 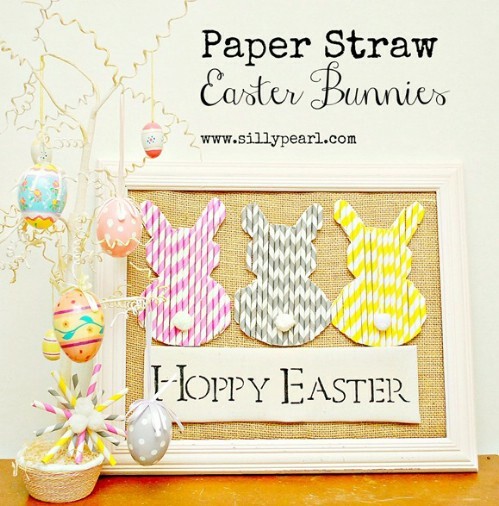 You just create the bunnies from paper straws, glue or tape them to a mat and then enclose them in a picture frame. You can use whatever colors you want, decorate it however you want and write any message that you want. An old caddy filled with a few key Easter decorations can make the perfect coffee table decoration for the holiday. You can add things like roses in a small vase, a small stuffed bunny or any number of other decorations to make it unique. A small market basket filled with fake grass and robin eggs is the perfect complement to your centerpiece, although you can actually fill the caddy with just about anything you want. Who says wreaths are only for Christmas? 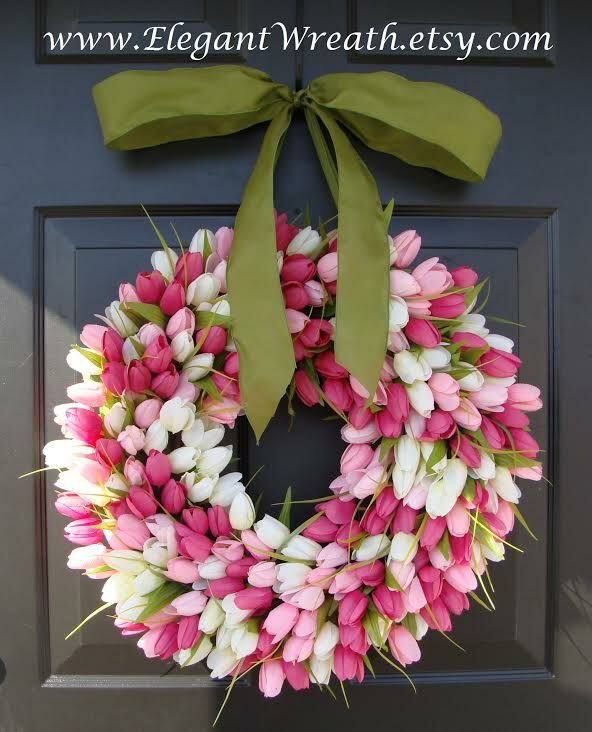 You can create this beautiful tulip wreath for Easter in just a couple of hours and the best part is you can use either real or silk tulips. Just choose the color combination that you want and then attach the tulips to a wreath base. You can get the base at most craft stores and a bit of greenery to go along with the tulips. Add a colorful ribbon to the top and you have a wonderful display for your front door. 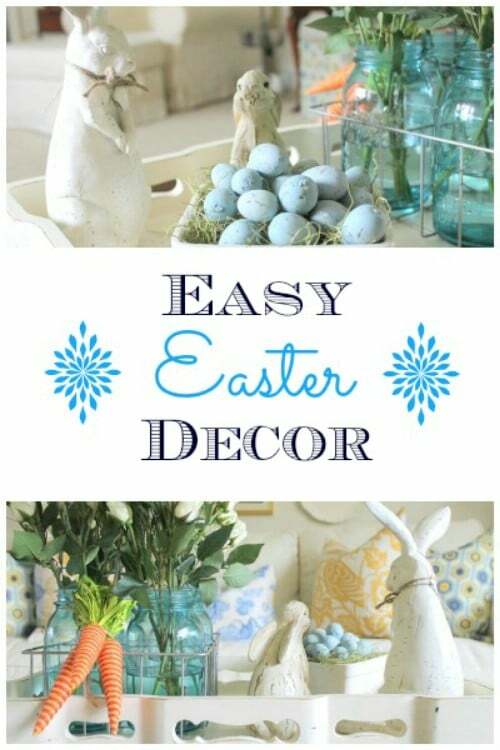 You can decorate your home for Easter so easily, and with things that you would probably buy anyway. Imagine a vase or jar filled with colorful jelly beans and sticks lined with marshmallow Peeps. 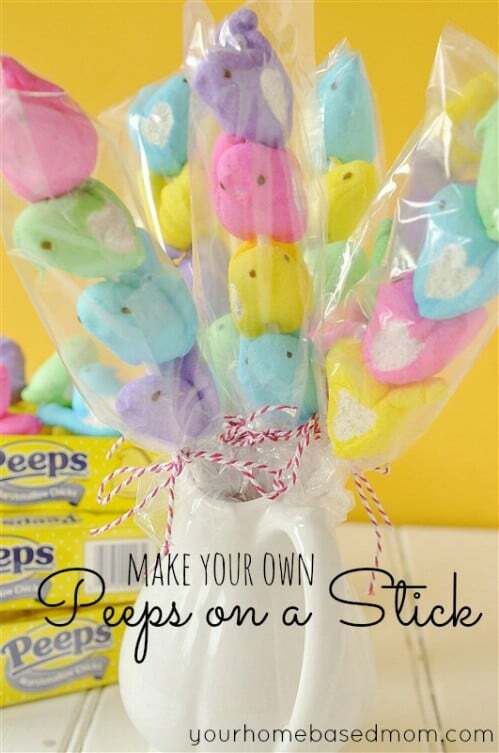 Peeps come in so many different designs and colors today that there are literally hundreds of ways that you can use these yummy candies in your decorating. 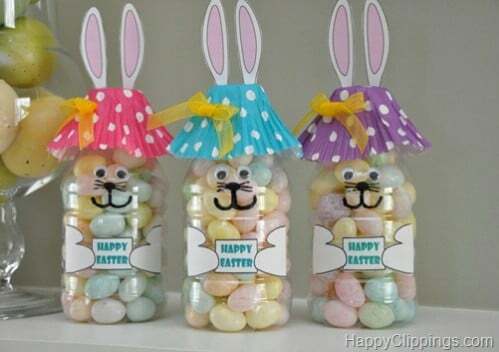 Fill clear glass jars or vases with jelly beans or use colorful Easter designs, whatever you want. You can really create an adorable Easter Bunny from just about anything you want. If you have loads of old buttons lying around, particularly in various different pastel colors, you can use those buttons to make a really cute Easter Bunny to adorn your front door. You just have to have a wire or plastic bunny or you can create your own with a rather large printable. This is a great project for kids and allows you to make use of all of those old buttons that are cluttering up your sewing basket. You did, of course with adorable framed paper bunnies. 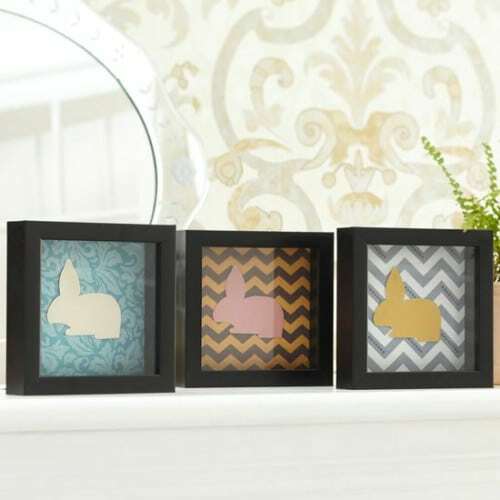 You can showcase the kids’ paper bunnies or make a few yourself and place them in little matching frames. 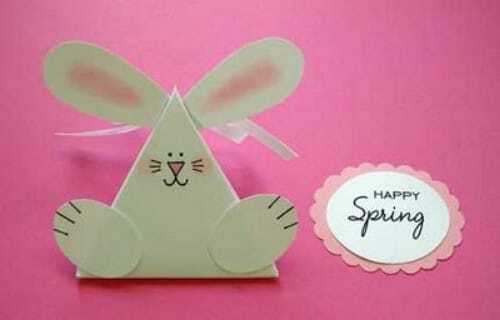 If you are going to create your own paper bunnies, you just need cardstock or construction paper. These are great for decorating a front hall or entryway and take very little time to make. 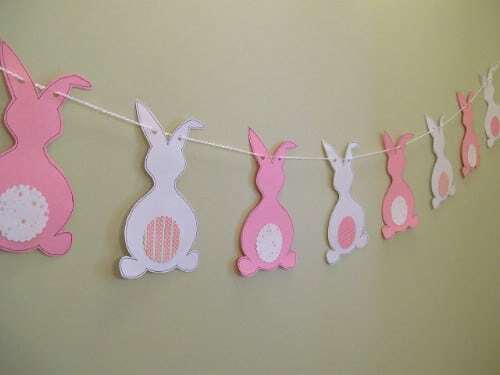 You can decorate the bunnies or leave them plain and choose your own backing or decorations. Sometimes the best home décor really is free. If you have Easter violets or other early spring flowers blooming outside your home, simply gather a few of them and make your own Easter bouquet. You don’t have to use actual Easter violets – any colorful flowers will do. 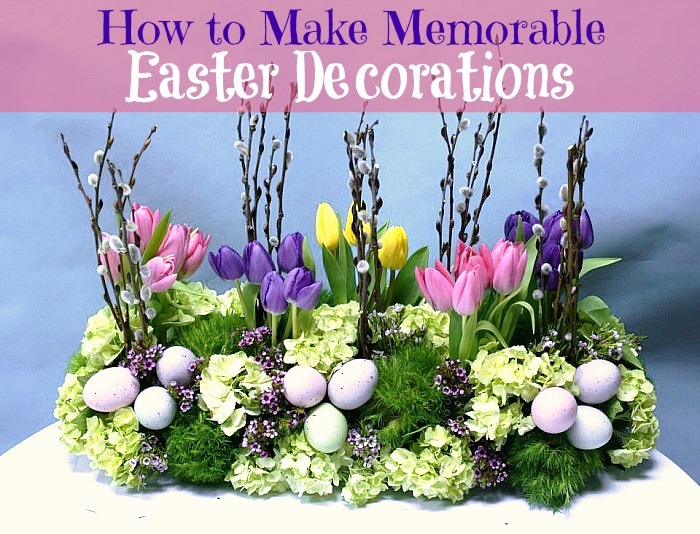 Arrange your flowers in a vase and tie on an Easter ribbon or add small decorations to make a great centerpiece. 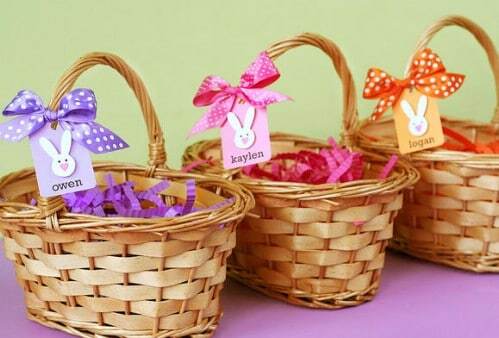 Baskets are everywhere at Easter time and you can use this to your advantage. Whether you have several planting baskets already on hand or you have old Easter baskets that the kids don’t use any longer, you can create beautiful outdoor decorations using these baskets. Seed starter pots are a wonderful choice and allow you to be as creative as you like. 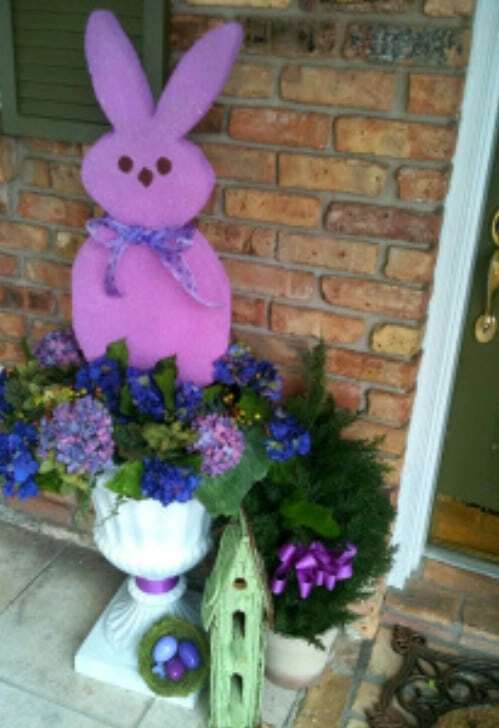 A foam Easter egg, construction paper or scrapbooking paper to make flowers and a topiary pot are all you really need to create a gorgeous (and quite huge) Easter egg to greet guests at your front door. If you wanted to scale it down a bit, you could also use a candle stand and create a mini topiary to place on tables. This is a really easy project and allows you to be very creative. You can make the eggs in whatever size you want – your local craft store should have various sizes of foam eggs on hand. There is no end to the projects that you can make with craft scissors. If you don’t have several pairs, you can pick them up at your local craft store. From carrot toppers for cupcakes to flowers for wreaths and several other things, you can cut your paper and cardstock with designs on them to make them really unique and pretty. Kids love using craft scissors (with supervision of course) so if you are planning an Easter party, be sure to have several pairs on hand to let their creativity run wild. Garland is one decoration that is used for multiple holidays and you can make your very own Easter egg garland with just some string or yarn and a few plastic eggs. You will need to cut holes in the bottoms and tops of your eggs to run the yarn through but that’s about it with the major tools. Just string your eggs in whatever color combination you want or string them in a multicolored look. This is another project that is great for kids. If you want to add a bit of Easter all around your home, you can make these wonderful little crepe paper carrots. Just add them to baskets here and there or use them to adorn a wreath or garland. They add a wonderful springtime look to the home and they are very colorful. In fact, you could make them in multiple colors so that they match your plastic eggs or stick with the basic carrot orange if you want. 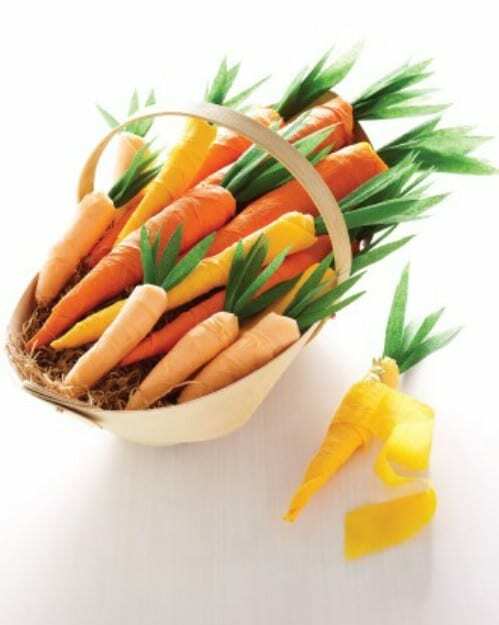 You just need paper streamers and you can use the carrots to hide surprises for the kids’ Easter party. Instead of spending money on an Easter table runner this year, why not make your own? You can create a beautiful country looking runner from burlap and you can stencil in whatever picture or message you want. 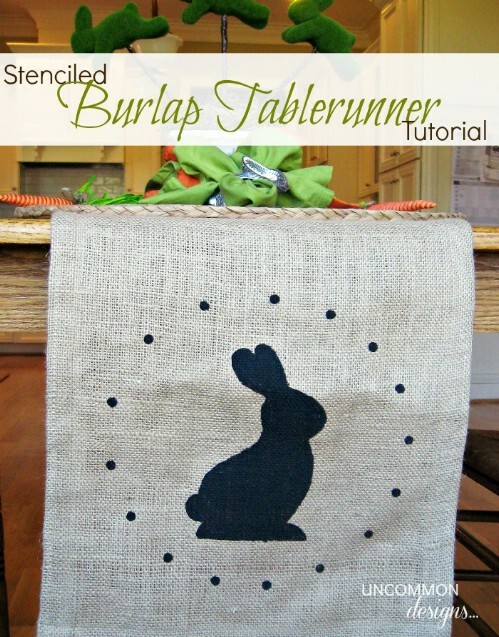 If you don’t really want a burlap runner, add a strip of wood to the top for hanging and create your own tapestry. You can sew this together with the machine or use fabric glue if you prefer a completely no sew method. Even the most beginning sewers can create adorable little stuffed bunnies for the kids to enjoy. 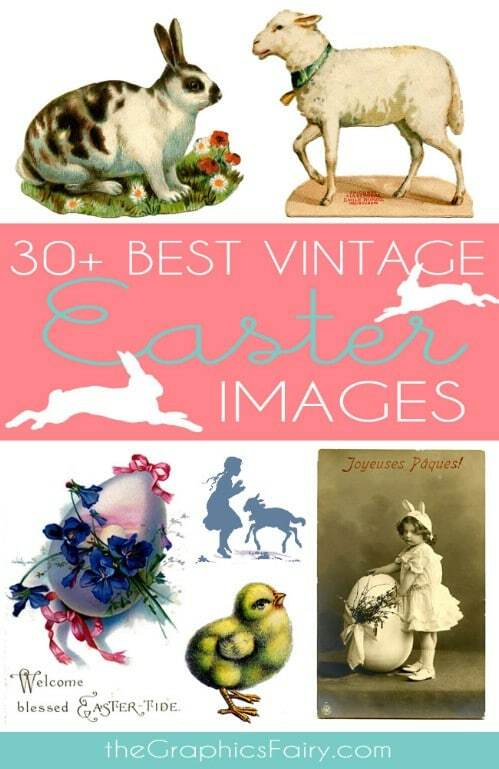 You can use these as Easter gifts or use them to adorn your home. Imagine a little Easter basket filled with cute little stuffed bunnies and a few plastic eggs. These are really easy to make and they take very little stuffing so when you buy a bag, you will have enough to do several. You can decorate them with pom poms or whatever you want. If you have little ones and want to set up a space for them to hunt eggs, consider filling an inflatable swimming pool with Easter grass and adding your eggs. This keeps little ones from having to compete with older children and gives you a bit more control over where they hunt. Plus, it helps babies who may not be walking well to get in the game and have a ball hunting those eggs. Kids love counting down the days to their favorite holidays. 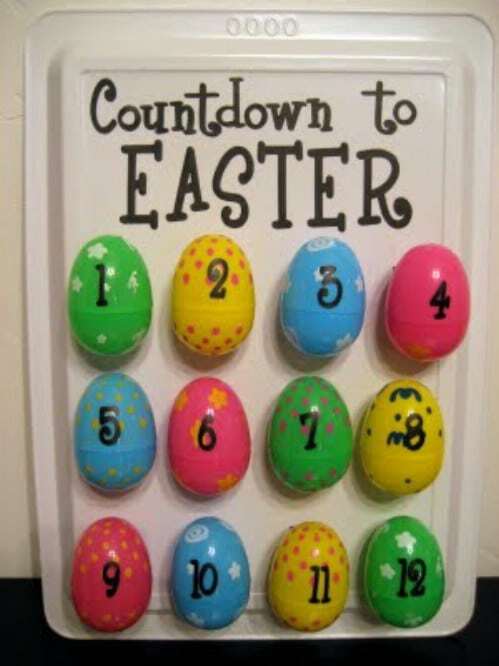 If your children love Christmas countdown calendars, why not make them one for Easter as well. 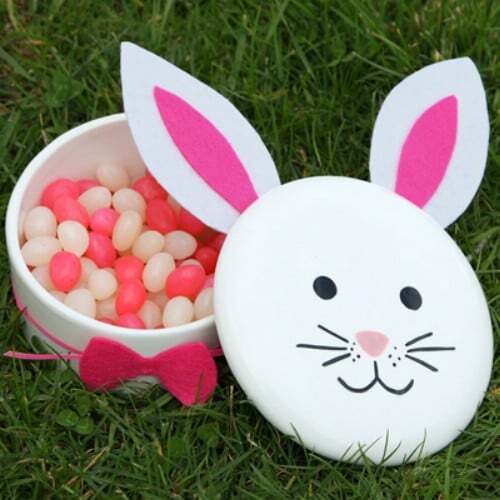 You can use plastic eggs to create the days and fill those eggs with little special treats. This is a great project that gives you much creative freedom. Fill the eggs with candy or with activities that you can do with your children every day to prepare for Easter. 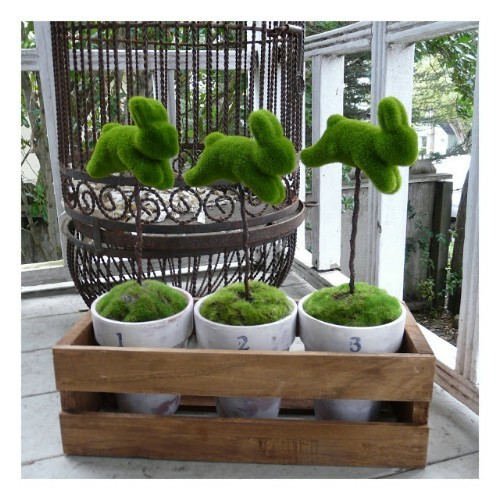 Give your outdoors a little Easter décor with moss bunny topiaries. Depending on how large you make these, you could use them indoors or out. You can buy the little bunnies made of moss or even make them yourself if you are so inclined. You will need planting pots to put them in and something to suspend them above the pot. 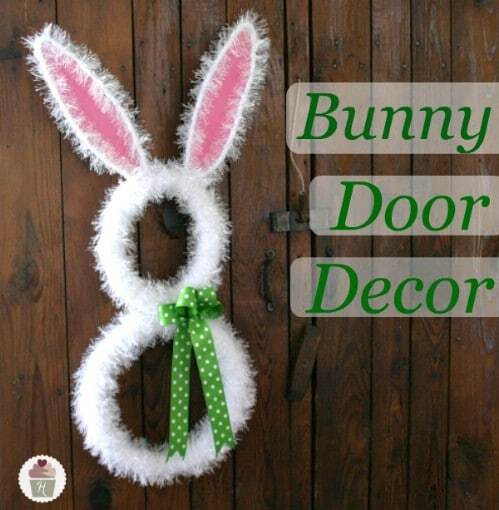 Make them large enough and they can decorate your entry door on the porch so that guests will see your Easter spirit when they reach your home. You can create a beautiful display for the front hall and give your home a wonderful spring scent as well. Felted sheep are really easy to make and when they are encased in a cinnamon stick fence, your home will smell wonderful. These little sheep are so adorable and take just a little time to create. 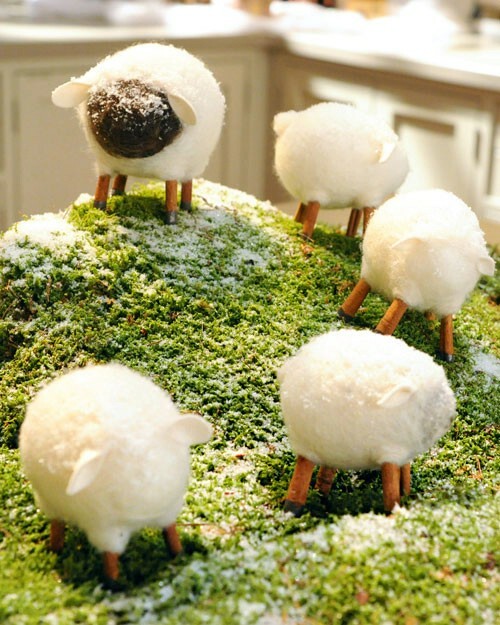 You will need several Styrofoam eggs (one for each sheep) and a few other supplies and you can create a really cute spring like scene for your home. 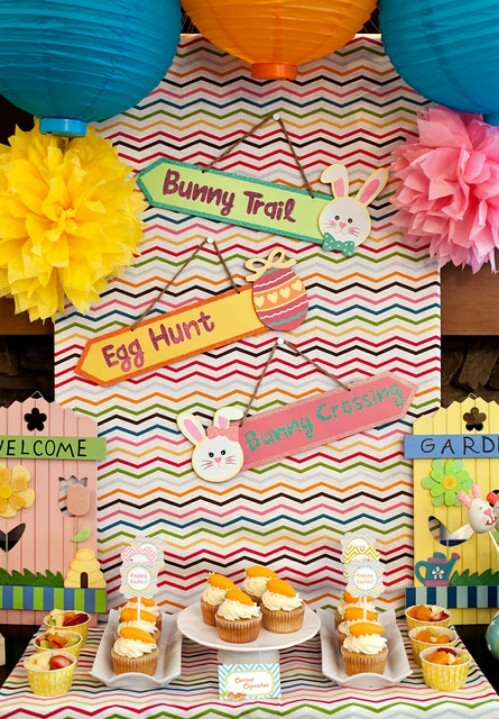 Whether you are throwing an Easter party or you just want a little project to help you decorate a fireplace mantel, bar or any other area of your home, this bunny banner is definitely a winner. You just have to trace the bunnies and cut them out of whatever cardstock or paper you want. Decorating is really easy and a great project for the kids. You can use your bunnies to display names or messages or just make them whimsical and fun. If you are planning an Easter party or if you just want something for the kids to take to school, bunny treat boxes are a must. These little boxes are easy to make and you can fill them with whatever goodies you want. Let the kids help you to create their treat boxes. They can draw on the face, cut out the ears or help you to fold the triangle boxes that make the bunnies. These are perfect for school parties or teacher gifts. Plastic eggs can be bought in many different sizes. 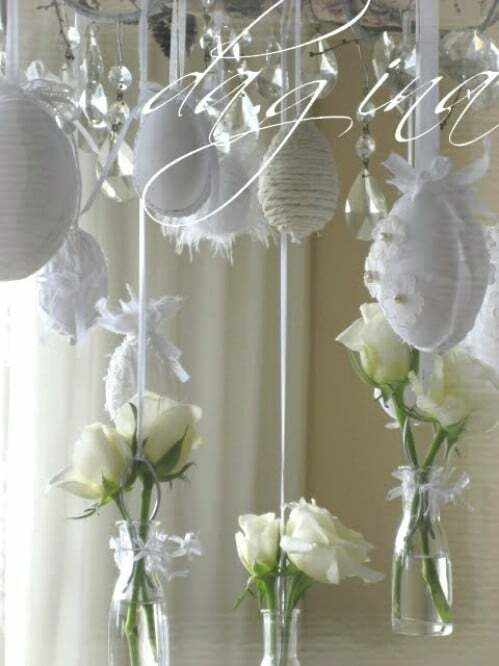 You can use those different sizes to create stunning hanging eggs that you can drop from the ceiling, a chandelier or anywhere you want a bit of Easter décor. The eggs can hang from ribbons and you can decorate them with crepe paper or a number of other coverings to make them really elegant if you want. What would Easter be without yummy jelly beans? You can create really cute and yummy looking topiaries with those jelly beans along with terra cotta pots, a dowel and some paint. Note that you will be gluing the jelly beans in place so you can’t actually eat them when Easter is over. You can make these in whatever size you want so if you are looking for something colorful for the front door, make them a bit larger – just be sure that outside animals can’t reach them. 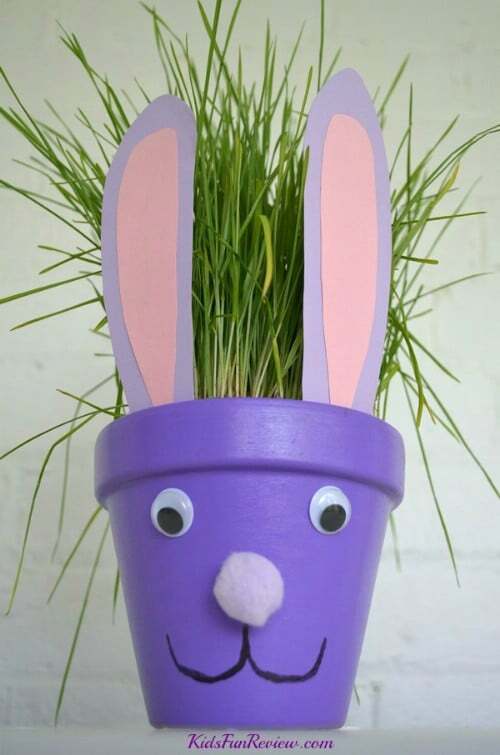 Take those terra cotta pots, paint them and turn them into adorable Easter bunnies. This is a great project for kids for school or church. The project takes very little time and when you are finished, you will have these adorable little Easter bunnies that double as planting pots for spring. These would be great as gifts for teachers or just anyone you want to give something a little extra special. 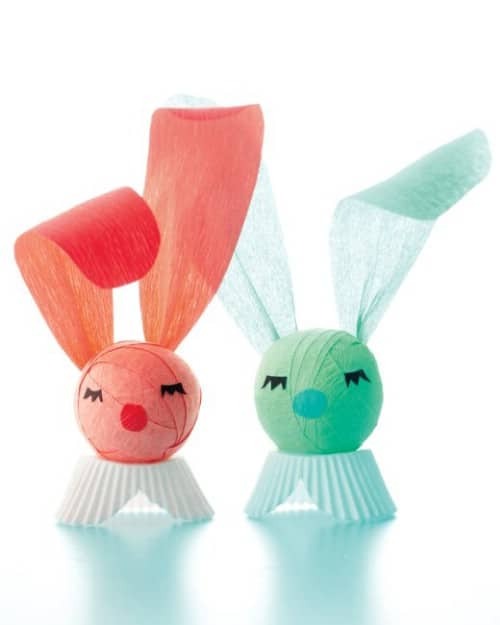 These little crepe paper bunnies hold surprises for the kids that are sure to please. As you make them, you add little trinkets so that when they are unwrapped, there are several surprises in each bunny. Working with crepe paper is really easy and allows you to create so many wonderful things. 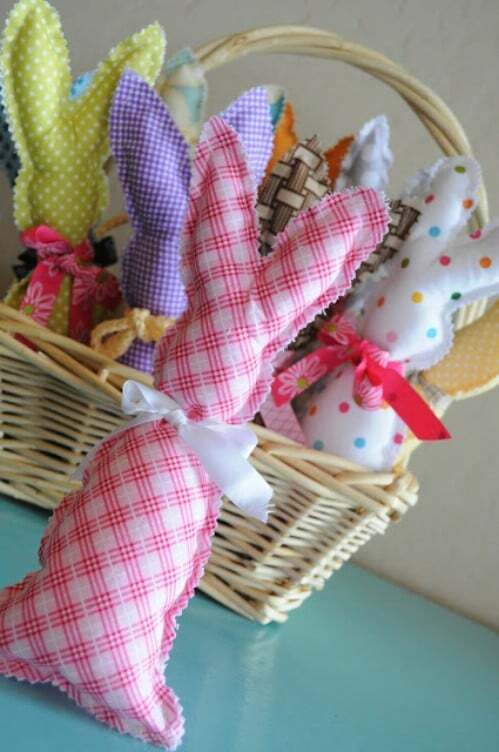 These little bunnies are perfect for teacher gifts or just make them for your loved ones at home. 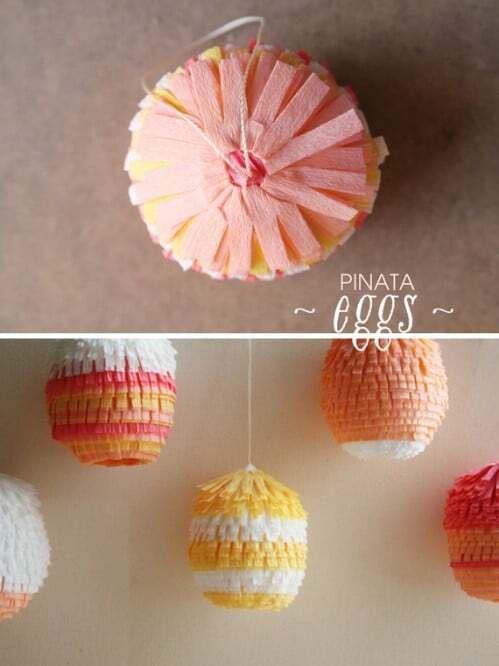 You can create colorful piñata eggs and hang them around your home or create larger ones to use for your Easter party. These little piñatas are relatively easy to make and look great when hung together. You use real jumbo eggs so you will need to learn how to blow out the eggs and try them properly. Once finished, these piñatas are sure to be the hit of your party. 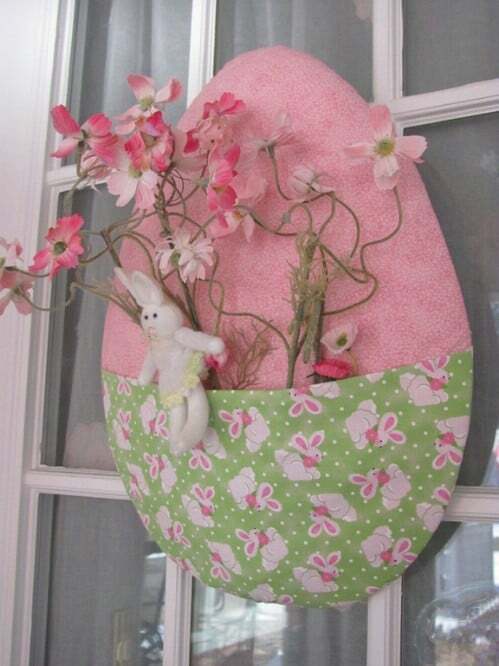 Or, you can just hang them around your home for a very colorful and bright Easter display. 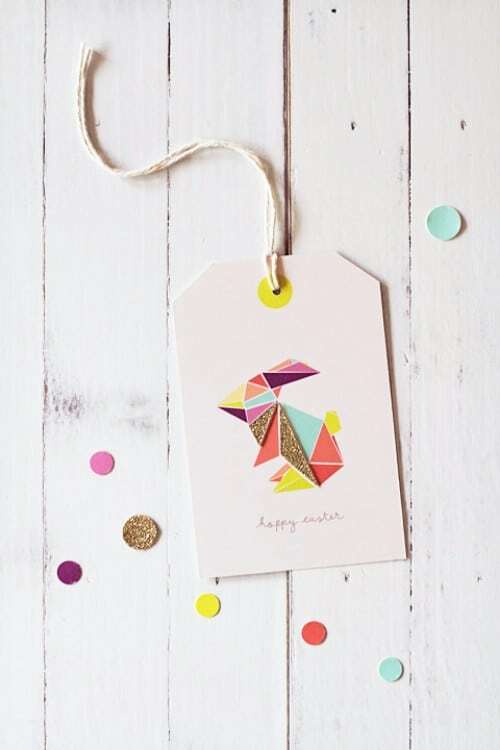 Dress up your Easter gifts with adorable origami bunny tags. You can also use these tags to just dress up your home. They are really easy to make and origami has a really beautiful and unique look. You can cut out clippings of anything that you want to create the origami look and you don’t necessarily have to have tags on hand – you can make those yourself as well. Whether you are looking for something to dress up your decorations or you need images to create framed photos, stock images are a great source. You can choose the images that you want, print them off and then do whatever you want with them. Colorful pictures encased in frames make lovely decorations or you can use smaller images to decorate your Easter eggs in a unique way. 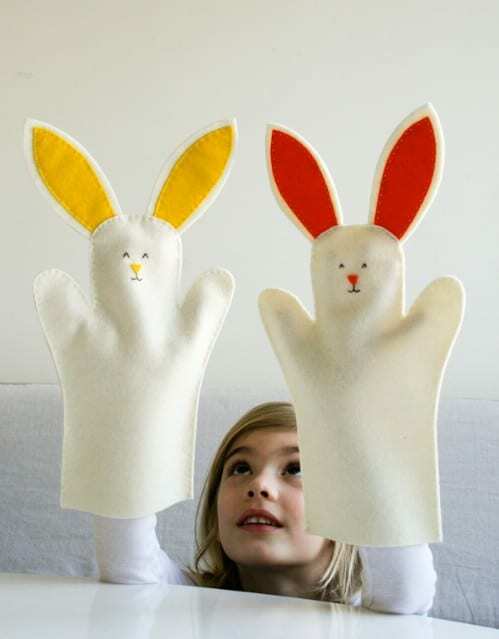 Make something that will really thrill the kids and create little bunny hand puppets this Easter. These adorable puppets can be sewn or you could use fabric glue if you prefer. Kids will love helping you to make them and playing with them afterwards. You could also make a bunny family out of puppets for a centerpiece display. 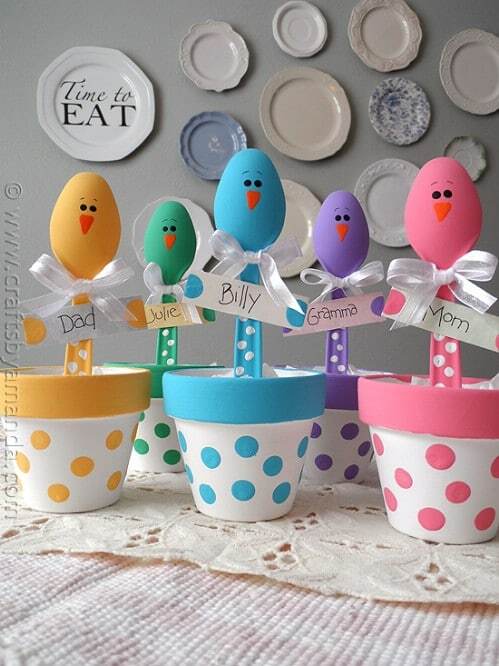 Make them in different sizes and let the kids put on an Easter puppet show. Wreaths are fine but if you want something really unique for the front door, this bunny hanger is perfect. You can get the supplies at your local craft store or Wal-Mart if you don’t already have them on hand and the entire project takes just a couple of hours from start to finish. Make it in whatever color you want and decorate it to make it truly unique. You can leave the top open or give it a face if you want. 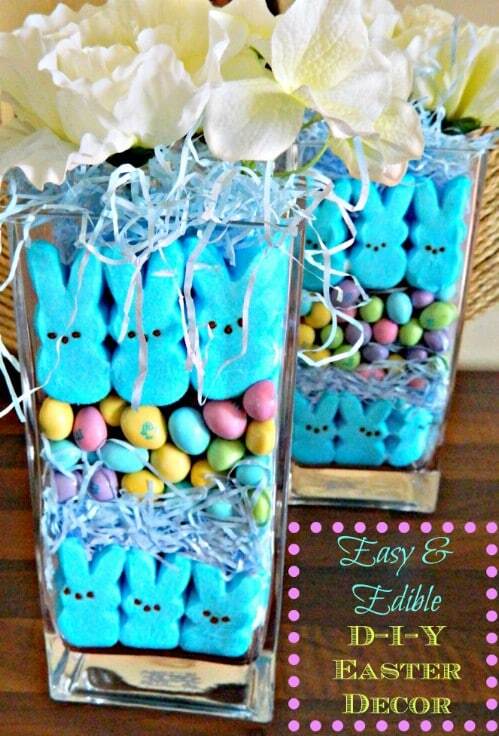 You can repurpose round boxes and dress them up for Easter. Add some jelly beans or robins eggs and you have a wonderful party gift or you can use these in your home as Easter candy dishes. They are easy to make and you have a lot of room for creativity. Make the ears from cardstock or use craft ears if you want. These are great to have just sitting around on tables for that yummy Easter candy and they give your home a bit of Easter cheer. 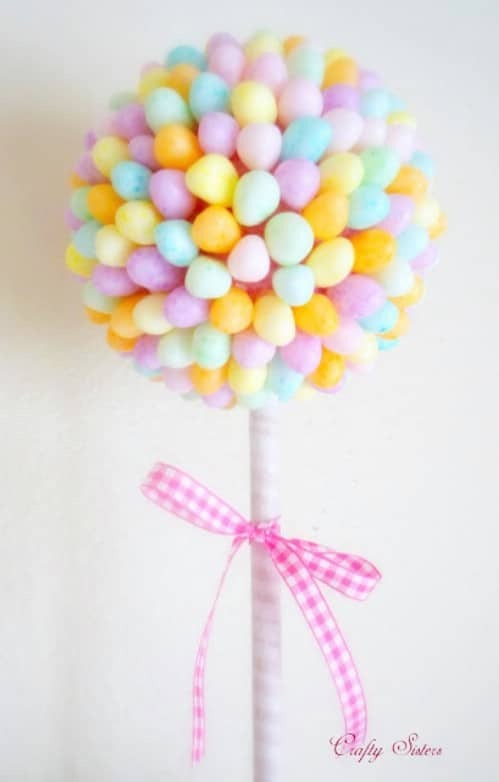 You can find potted Easter trees at most department stores or Dollar Stores this time of year for around a dollar or so each. 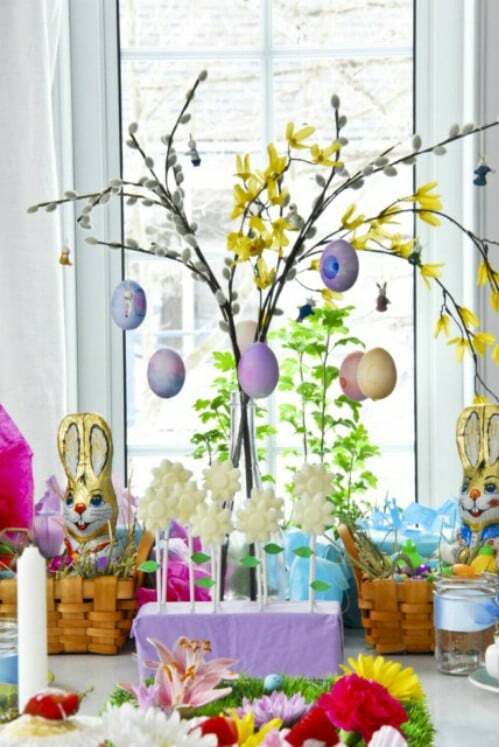 You can use those trees and some plastic eggs to create beautiful Easter trees. Just paint the eggs with glittery paint or you can leave them plain if you want. 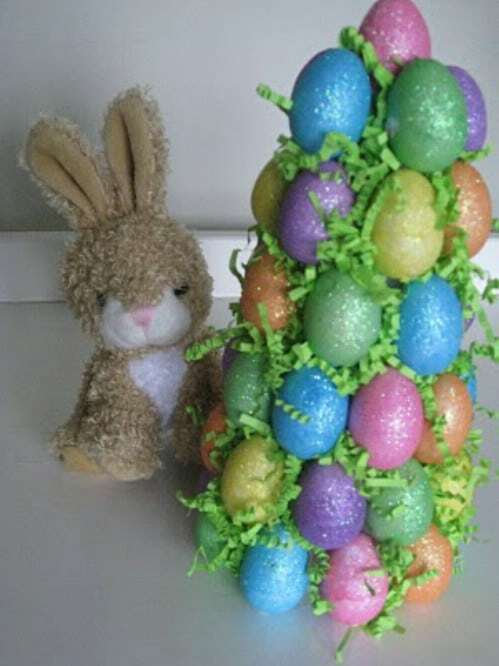 You can also normally find decorations for Easter trees for around a dollar or so a package so you can add small bunnies, carrots and other decorations to really make those trees look good. 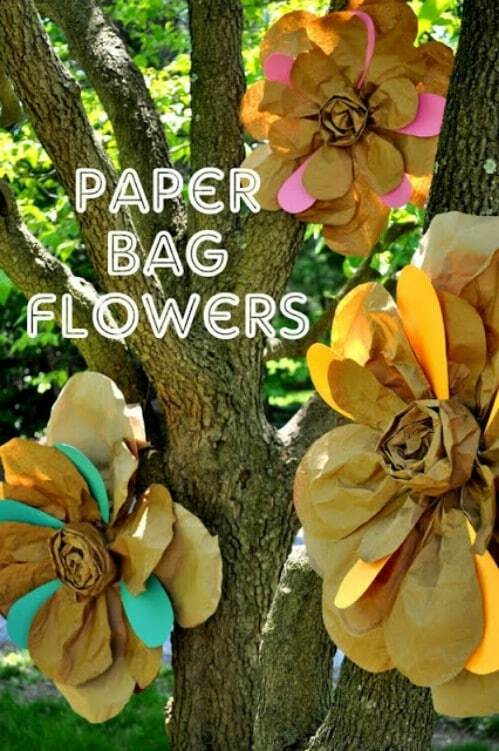 Creating your own flowers from old paper bags is easy. This is also a great way to repurpose those bags and keep them out of the garbage. You just have to trace the template onto the bag, cut and then fold to create the flowers. This is a project that will cost you nothing if you already have a few bags on hand and if not, ask your grocery clerk to bag your things in paper the next time you shop. A fabric garland would be perfect for decorating the mantel. If you have fabric lying around or quilting squares, you can create a really colorful banner to go just above your fireplace mantel. Add other decorations such as plastic eggs, framed Easter pictures or stuffed bunnies and you have a wonderful focal point for the room. Clear glass jars of jelly beans and bowls of glittery eggs are the perfect complement to your banner. 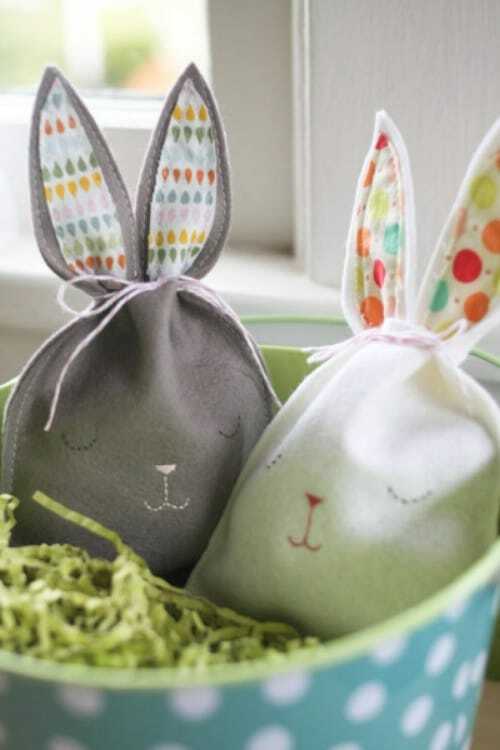 No Easter party will be complete without adorable sleepy bunny goody bags. These little bags are sure to perk up your party and work great for teachers’ gifts as well. You can sew them together or if you prefer, just use strong fabric glue for a no-sew project. Then just fill them with whatever goodies you want and they are ready to go. You tie the ears together to make the bunny look authentic and to hold those goodies in place. Yellow daffodils are beautiful flowers that come out right around Easter. 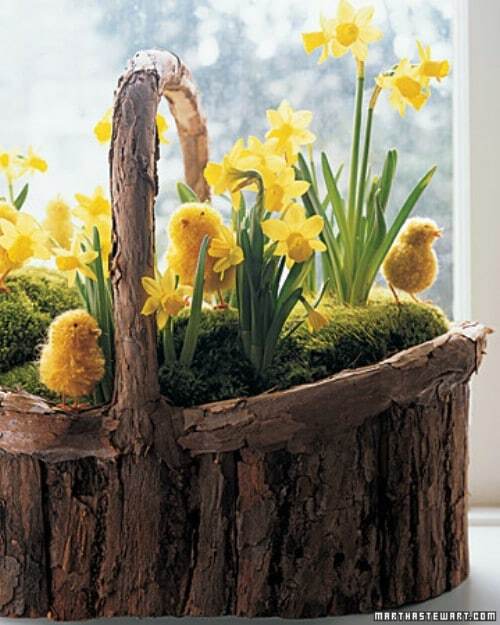 You can use those flowers to create a stunning basket, complete with little chicks made from pom poms. Yellow yarn creates the chicks and then you just have to arrange them in a basket with your daffodils. If you intend to display the basket for long, you may have to replace the flowers every few days to keep them looking fresh. 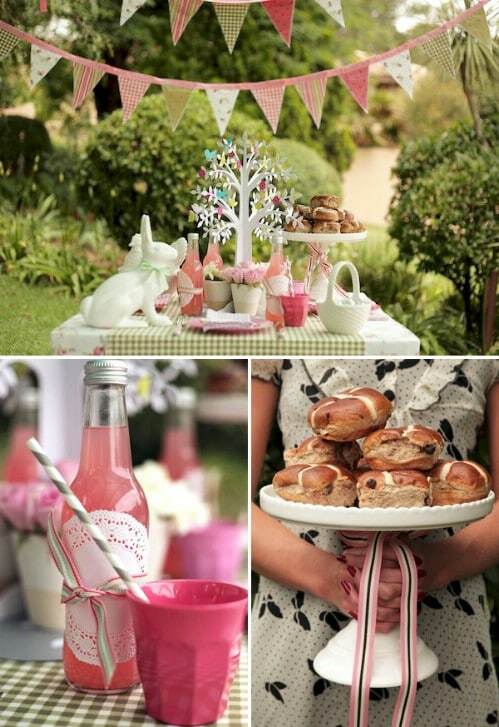 If you are planning an Easter brunch, there are wonderful things that you can create to make your meal very special. From place settings and egg hunt signs to banners, it will take very little time to make your brunch look like you’ve spent days preparing. You just have to provide the food and everything will fall perfectly into place. You can even create your own invitations to go along with your brunch theme. Bird’s nests make lovely décor and you can create your own with just a bit of nesting, some eggs and something to hold your little nest. You can fill the nest with robin’s egg candies or choose decorative eggs. Decorate with small plastic birds or just anything you want. 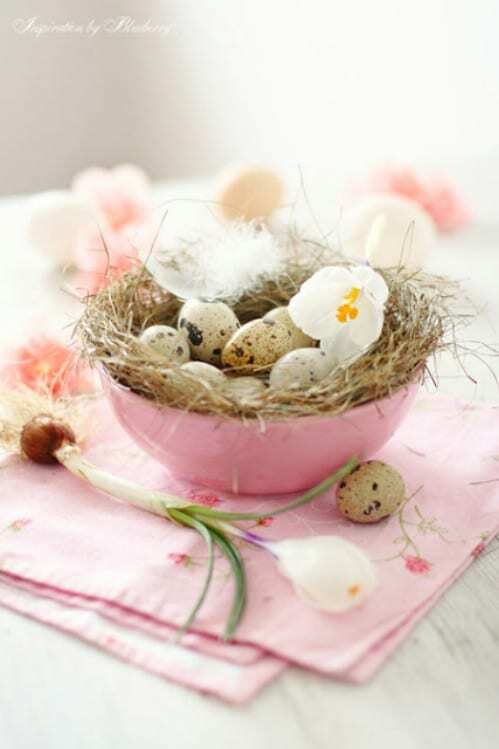 These little nests will look great adoring your home well past Easter and into summer. 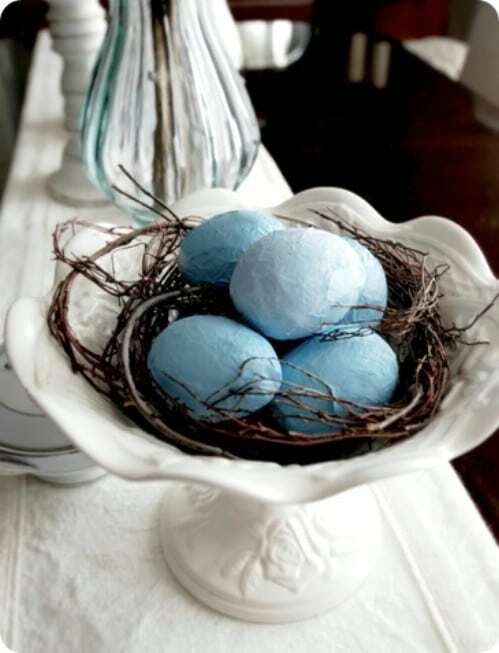 Bird feathers and eggs go well together and can help you to create lovely Easter décor for any room. Feathers can be purchased in different sizes and colors from many craft stores and you can use plastic eggs or decorative eggs in glass or other materials. 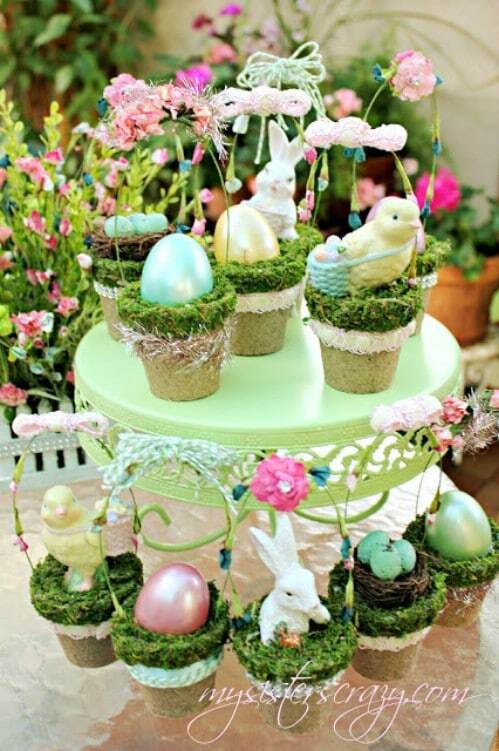 The two work together to create a stunning Easter display that is perfect for spring. 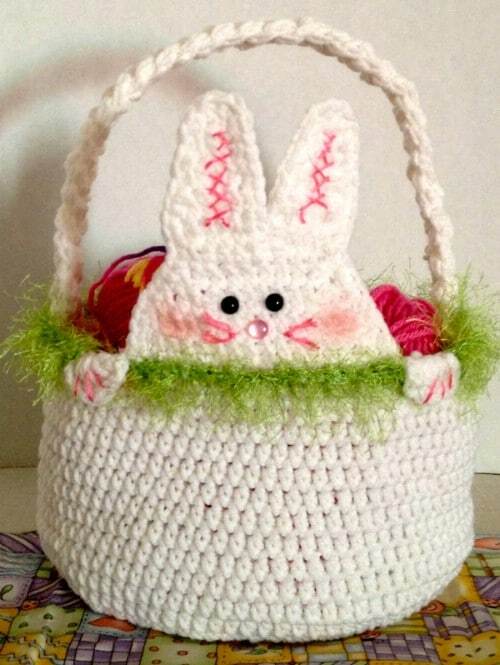 If you love to crochet, you can create a cute peek-a-boo basket that is perfect for a centerpiece or mantel decoration. You could even crochet these for the kids to use during their Easter egg hunts. The pattern is really simple and the entire project won’t take more than a day or so to complete, so you have time to do several if you want before Easter arrives. 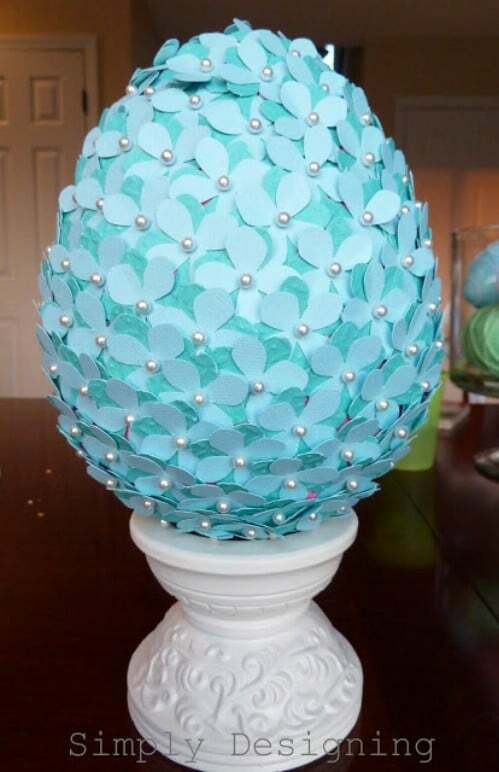 Adorn your door this Easter season with a lovely Easter Egg that you can make in just a couple of hours. You just need to decide what fabric you want to create the egg and then put it all together. This is a really simple project that takes very little materials and even less time. The egg even has a catch-all pocket in the front for placing additional decorations if you want. 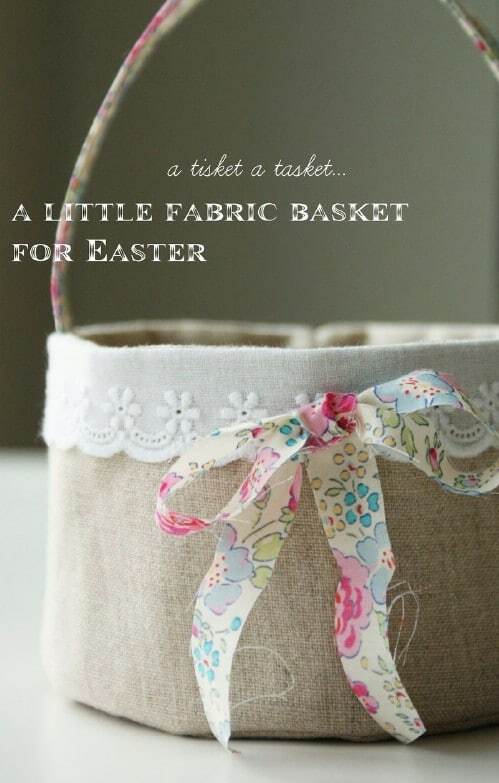 Thrill the kids or create beautiful home décor with a homemade fabric Easter basket. This is a relatively easy project even for beginning sewers and you can do it by hand or use your sewing machine. You could also likely use fabric glue if you prefer not to sew at all. You can choose whatever fabric you want and adorn the basket with eyelet lace or anything else you prefer. Fill it with candy or use it for a gift – it’s perfect either way. 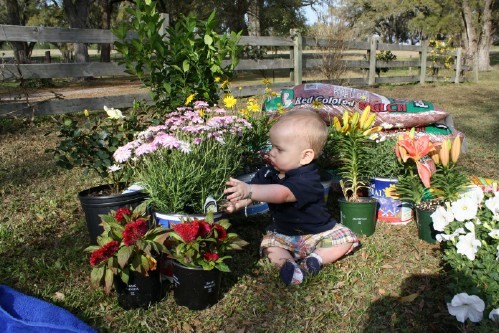 You can create an Easter garden with potting soil and a flower pot. 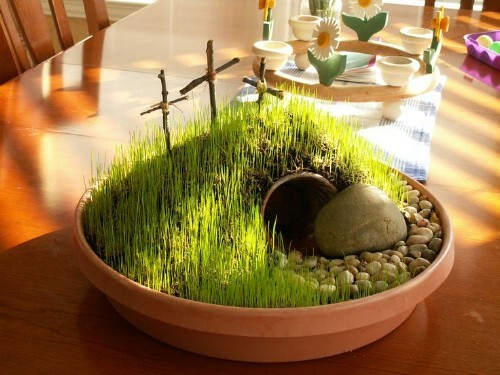 If you want to express your religious beliefs, you can do so by planting a garden that shows the tomb and crosses synonymous with the Bible’s Easter story. Using real grass seed gives you a real garden. Just remember to keep the garden in a warm location with lots of sunlight and give it plenty of water every day. If you are looking for an all-natural way to celebrate and decorate for Easter, these little eggheads are perfect. 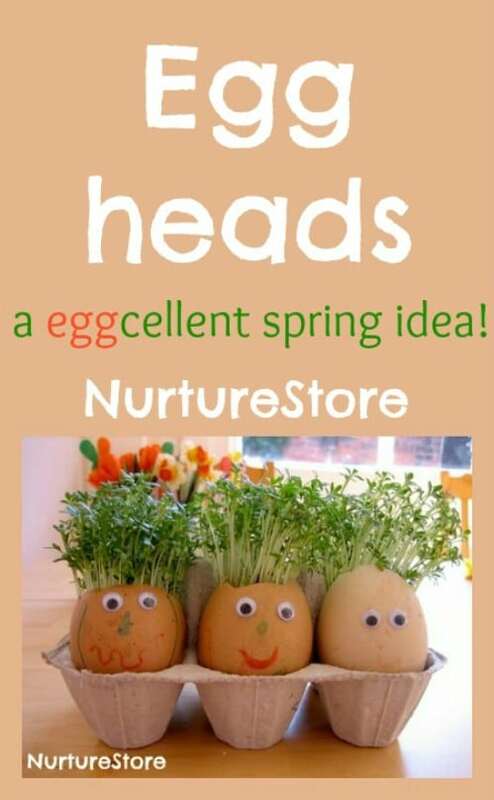 Kids will absolutely adore creating little egg people and growing cress which doubles as hair. You can use the eggs in the shells for baking, just remember to crack them really close to the top so that you have room to plant the cress. This is a cute project and one that helps you to reuse those empty eggshells and grow your own cress at the same time. If you are looking for ways to really dress up your Easter treats, there are many. 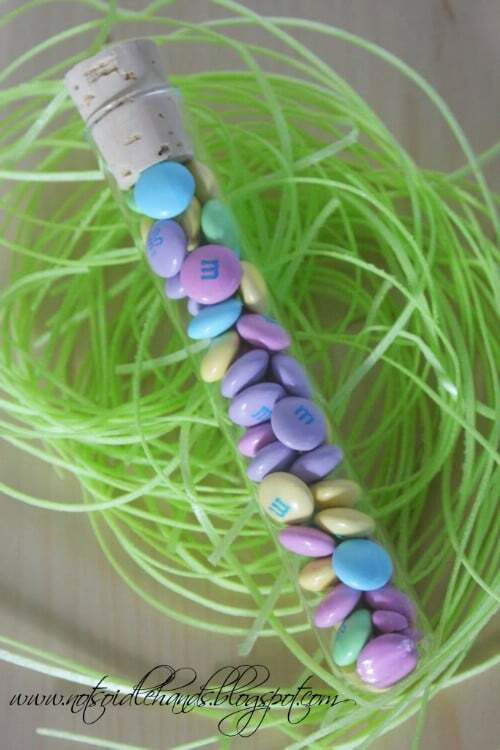 You can use plastic tubes for holding pastel colored candies or put edible grass in a jar and decorate with a chocolate bunny and colorful jelly beans. There are so many ways that you can create lovely treats for giving or simply for sitting around your home and helping you with your Easter decorating. 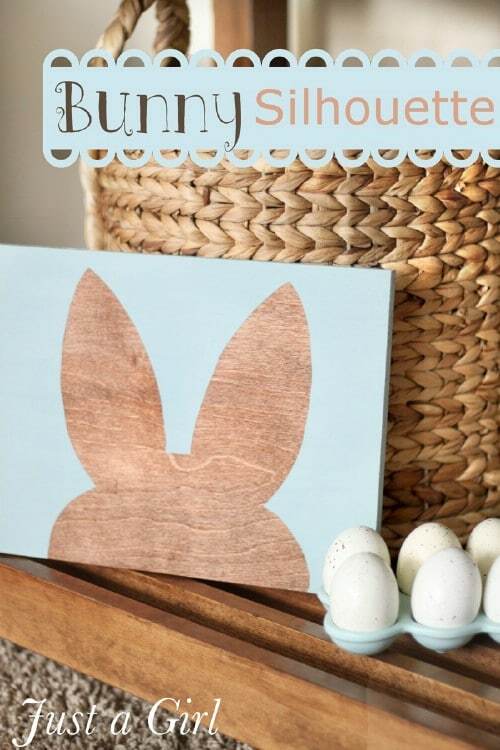 A piece of wood leftover from another project, some crafter’s paint and a bunny template will help you to create a beautiful silhouette that you can hang in your living room or sit beside your favorite Easter display. This is a project that will actually take less than an hour and gives you a really elegant silhouette that is sure to please any guest who sees it. Incidentally, it would also make a wonderful gift. Stuffed bunnies can be made of virtually any fabric. 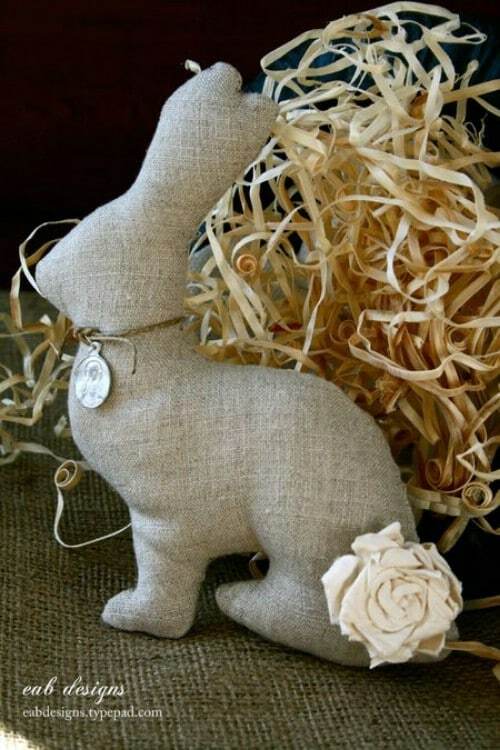 Linen will give your homemade bunnies rustic country charm and these little bunnies are relatively simple to make. You can stuff them with traditional stuffing or if you have fabric lying around that you have no use for, use that for stuffing instead. Adorn the bunnies with whatever you want to make them unique and use them to add a bit of spring to various areas of your home. You can add a bit of spring to your indoors by planting flowers in decorative vases. You don’t necessarily have to plant those flowers outdoors. 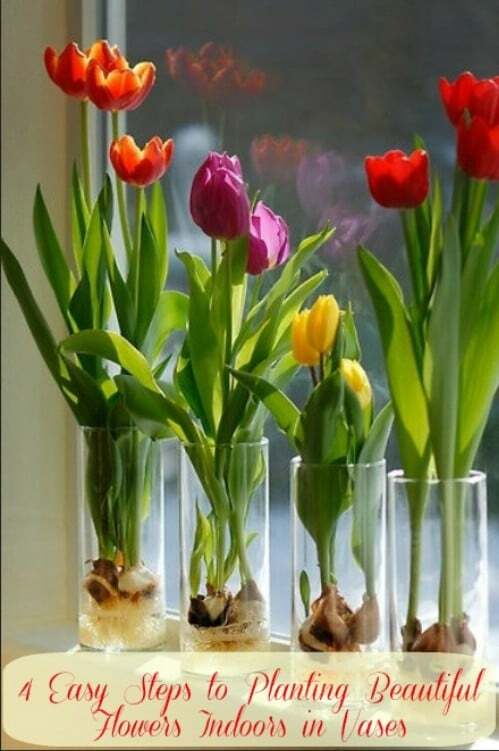 If you are in an area where spring comes late or if you just really want to bring the outdoors inside, you can easily plant flowers in vases and have them in every room in your home. You do have to remember to water them and keep them in sunlight throughout the day but most flowers will grow wonderfully in vases and look beautiful, too. Remember those napkins folded into swans? Well, you can fold your napkins into bunnies and make wonderful decorations for your Easter dinner table. 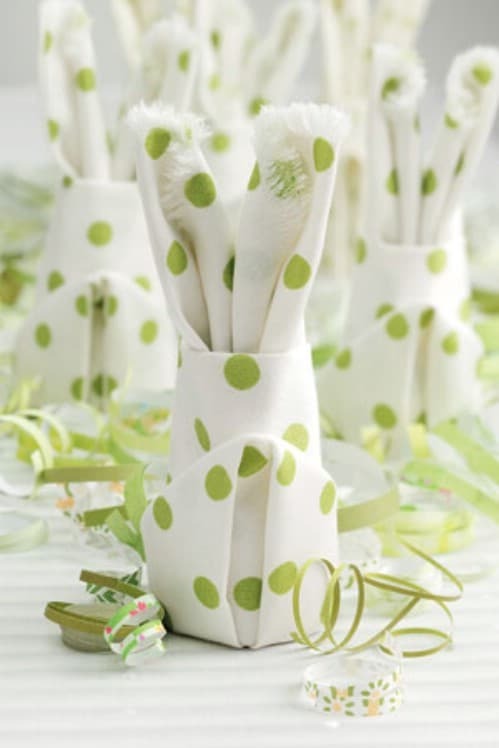 Any color of napkins will work and you can make an adorable bunny for every place setting. The napkins are pretty easy to fold and kids will love to help with this little project. You may even get them to set the table when the bunnies are finished. 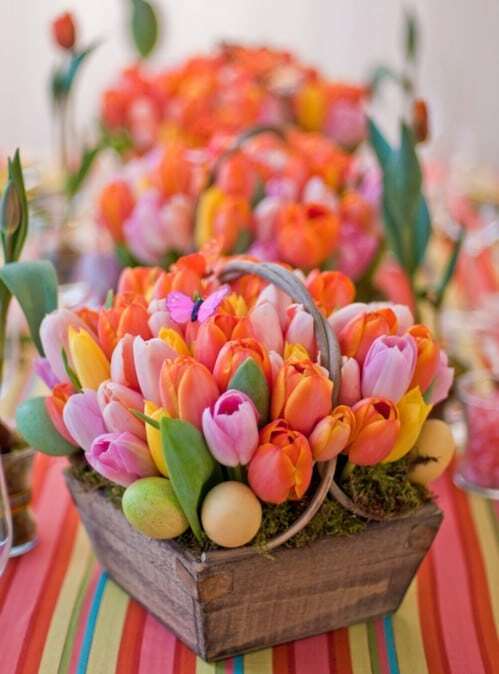 Tulips and plastic Easter eggs combined make a wonderful centerpiece for your dinner table or for a side table decoration. You just need the tulips (choose real ones or silk ones, whatever you want) and some plastic eggs of different colors and sizes. The basket can be anything you want from a wooden crate to a glass bowl. This is a great way to bring out all those pastel spring colors and gives you a beautiful centerpiece for Easter dinner. Jelly beans are great for decorating. They are colorful and work well when you combine them with candles. Imagine a centerpiece that includes a glass bowl or candle holder, colorful jelly beans and pillar candles. You can use jelly beans in any color combination or make it elegant by using just one color. This simple candle display can be put together in a matter of minutes and will look beautiful gracing your dinner table. Think about your Easter dinner table and what you want adorning it. 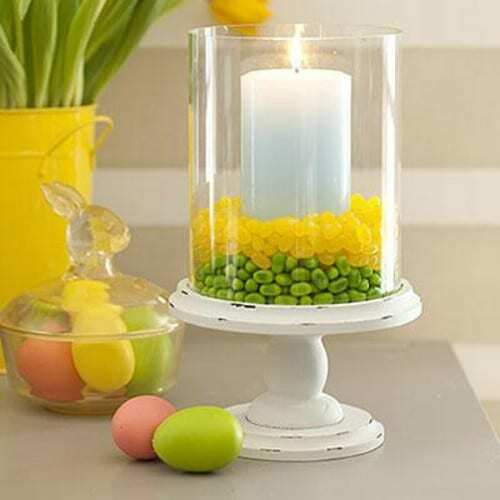 There are many ways to dress up a table from plastic eggs to baskets and candles. 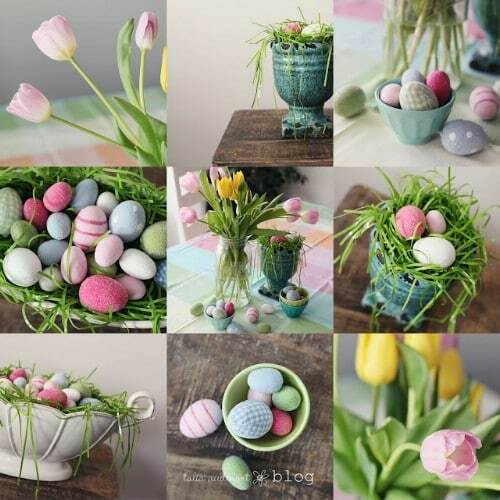 An Easter tree, a box of faux grass with plastic eggs or even a box with candies on sticks – all of these would make wonderful table decorations. 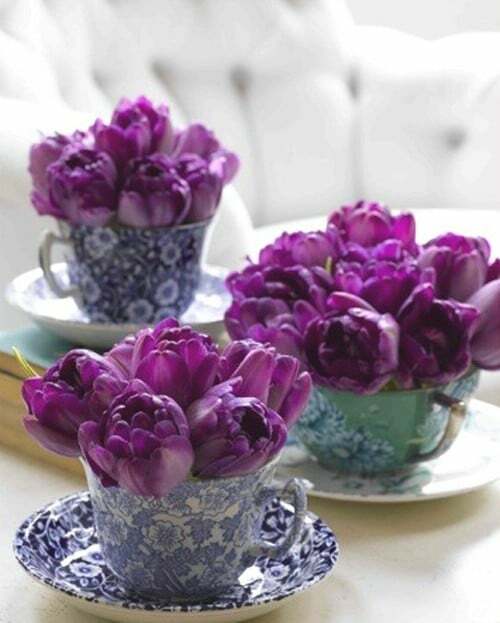 There are many things that you can create that take little time and will give your table a great spring look. Those colorful buttons can be put to good use when you choose to make your own button Easter eggs. Kids will absolutely love this craft and it is easy enough for even toddlers to do. You will want to supervise to make sure that no one gets a pin through the finger. The gist is to use a Styrofoam egg and cover it with buttons using colorful pins. 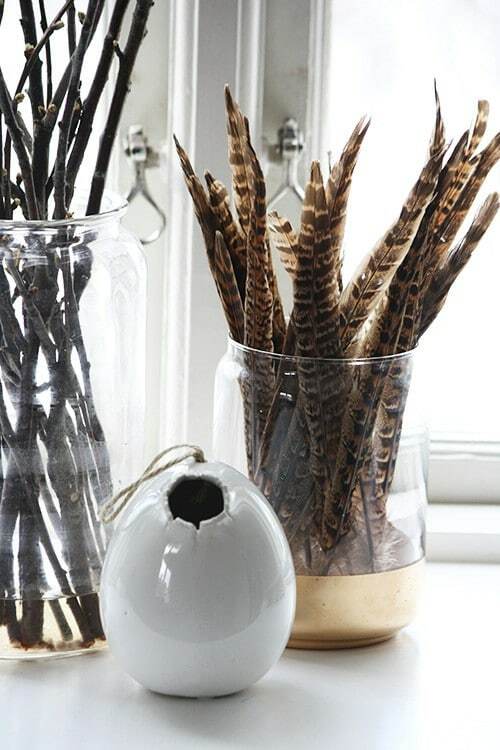 You can then place those eggs in a bowl or use ribbon to dangle them in various places around the home. 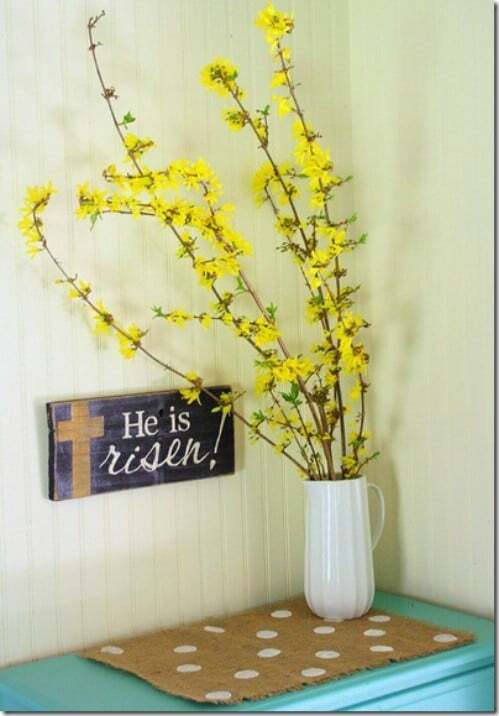 If you have some old wood, you can create beautiful rustic signs that express your faith or just decorate your home with an Easter theme. Use the wood to say whatever it is you want to say and then hang your signs around your home’s interior or on your front door. This is a great project that allows you to be as creative as you like and gives you freedom of expression. 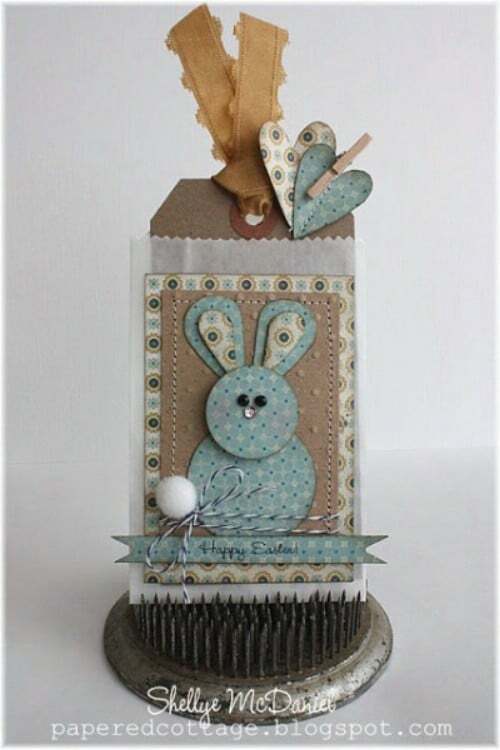 Happy Easter tags are easy to make and give you the chance to use up some of those scraps that are leftover from other projects. Whether you plan to use the tags for gifts or you just want something unique to decorate your home, this project is easy and takes very little time. You can hang the tags or just sit them up against other Easter décor. Put several of them together to make a banner that hangs over the mantel. 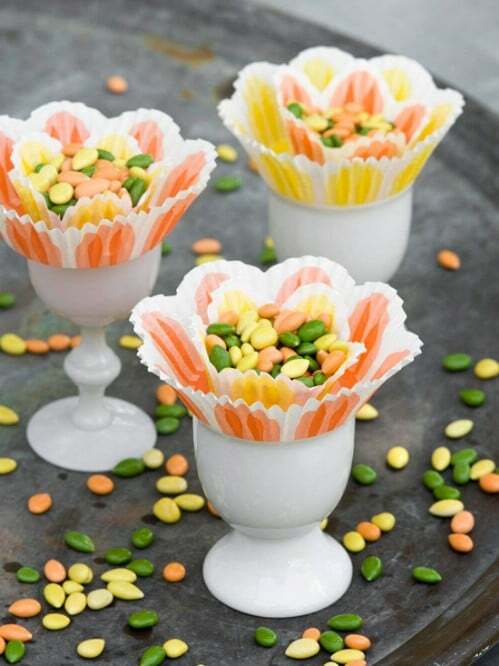 You can display that Easter candy with charm when you create these adorable flower Easter cups. You just need paper baking cups in decorate pastel colors (or in any color you want) and the candy that you want to fill them up with. You can create place cards and use these for place settings at the dinner table or simply have Easter candy sitting around in various places in the home. Paper mache is fun and kids love it. You can create adorable paper mache Easter eggs with real eggs (blow out the inside and wash and dry first). Then just do your thing with the paper mache and make a number of these in various different colors. They are great for placing in baskets or you can simply leave them lying around the mantel or anywhere else that you have Easter décor. Your mantel is probably the focal point of the room and as such, should be decorated for Easter. 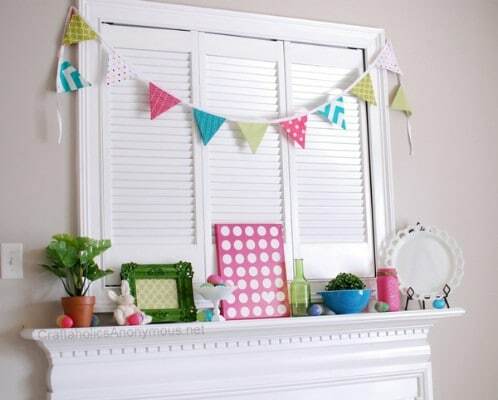 Whether you plan to hang a banner, create garland from plastic eggs or you have pictures or signs that you want to display, there are many ways that you can dress up your mantel and make it more spring-like. Choose pastel colors and group your Easter decorations together in this one area to create a focal point that is sure to get attention. A hanging bucket or basket and some colorful tulips will be the perfect spring decoration for your front door. 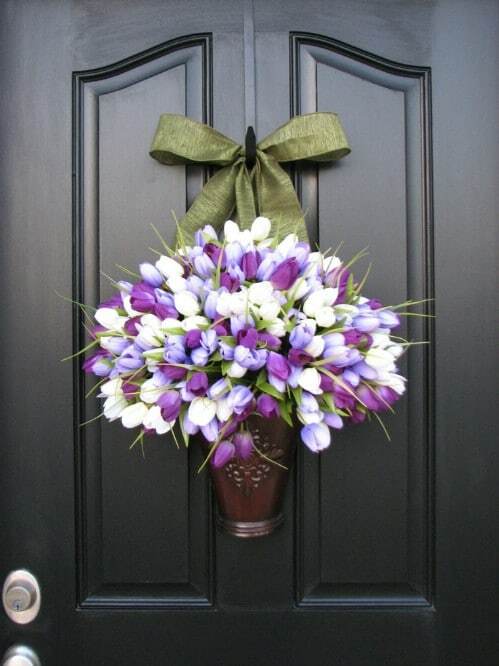 Whether you use real tulips or silk ones, you can create a beautiful decoration for the door that is sure to give your home wonderful curb appeal. Just choose tulips in the color or colors that you want or select several in multiple colors for a really spring-like display. Hanging buckets can be purchased at most craft or department stores if you don’t already have one. Paper strip egg art is something that the kids can help with and something that will look great decorating your home. 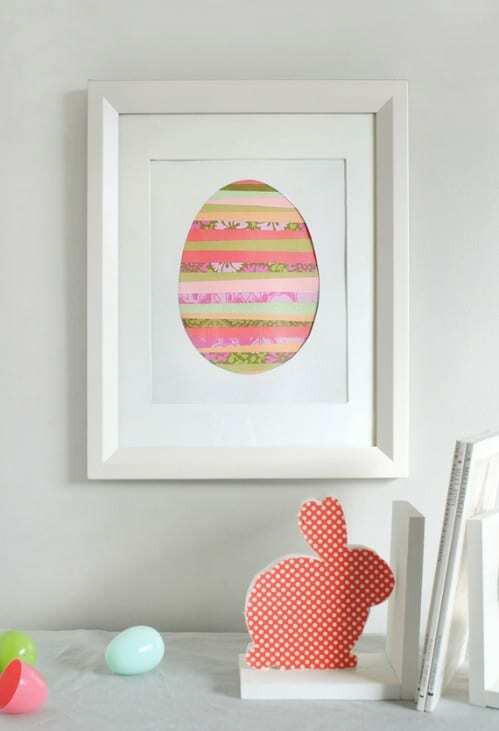 You can use any number of different papers for the actual egg and then just mat and frame your colorful paper strip egg in any frame you want. You just have to cut the strips of paper and then arrange them into an egg shape. Frame and you are all set. An old crate can be turned into the perfect container for those spring flowers and arrangements with a little paint and some imagination. 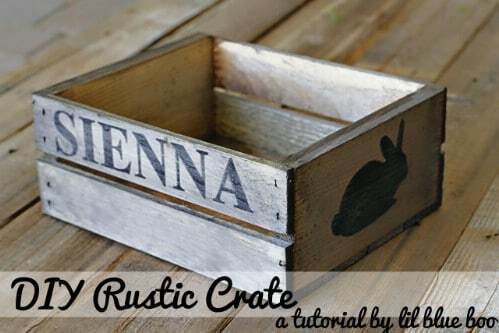 If you don’t already have a crate, you can usually find them pretty cheap at yard sales and flea markets. Or, you could just build one yourself. Stencils and paint help you to customize the crate and then you just fill it with Easter grass, eggs, flowers, candy, or whatever else you want. 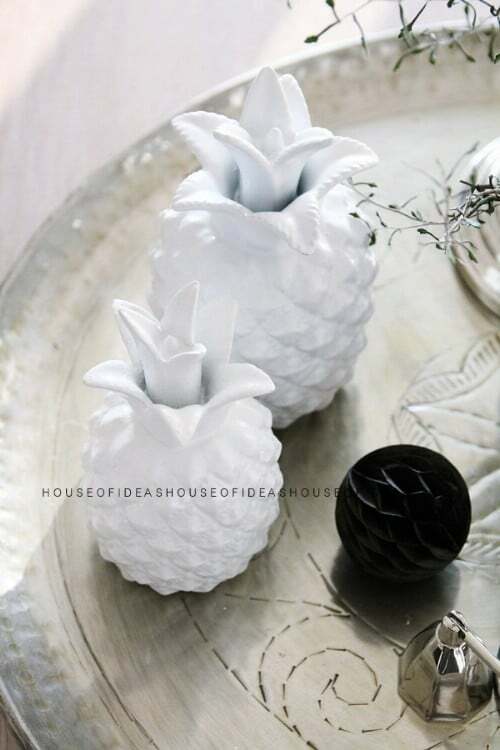 If you have décor that just really doesn’t seem to go with your theme or you want your Easter decorations to look really elegant, you can paint them white. This goes for things like chicks, bunnies, sheep or just about anything else you have on hand. Arrange these pieces together and you will have a beautiful and elegant display that screams Easter – particularly if you add a few gold or silver eggs to the mix. 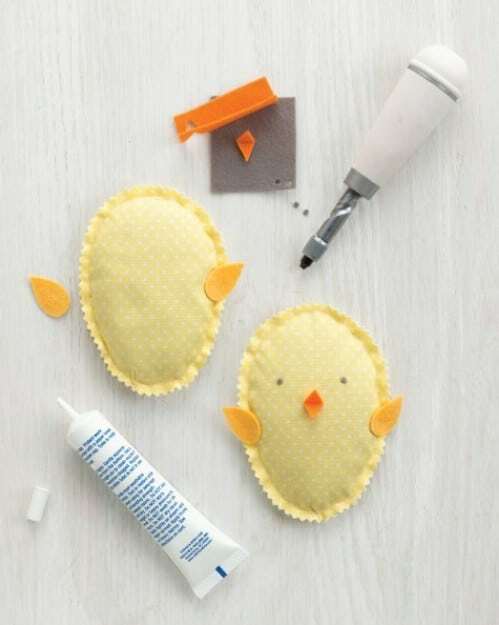 Whether you want something that the kids can play with or just a cute little chick for added decoration, these little beanbag chicks are perfect. And, they are easy to make. Split peas make up the stuffing so they are safe for kids and the environment. The best thing is that there is no sewing required. You just use fabric glue to hold the felt together and then decorate – easy peasy!